Charles V, the Emperor Maximilian I's grandchild, came to the throne in 1516 and was elected Roman King and Emperor in 1519 in spite of all the endeavors of his rival, King Francis I of France (1515-47). At that time Charles was still an unknown quantity in international politics. The enterprising and martial Francis I, embittered by his electoral defeat and continually striving to break Spain's stranglehold on his country, remained his intransigent opponent. He revived France's old claim to Milan and expected few difficulties from the young man by whose abilities no great store was set. In the decisive battle of Pavia in 1525, Charles' German-Spanish army brought to a halt the victorious French advances in north Italy. The French defeat was complete and Francis himself was taken prisoner. With one stroke the young Emperor had become master of Europe, and all eyes were on him. Kolman Helmschmid's work for the Emperor, the armour garniture embossed with a diamond pattern, was probably made during this period of triumph. After his grandfather's death Charles had taken over the Augsburg master as his royal armourer. With this garniture, Helmschmid followed the almost baroque taste of the period, which is manifested for instance in the Bargello armour. The embossed diamond pattern on the borders provides the highlight, and the work is further beautified by the finest gilded etching by an Augsburg artist. The puzzling letters "KD" which appear on the left shoulder can probably be interpreted as meaning "Karolus Divus", because "divus", the Divine, is part of the ancient imperial title. Apart from the traditional Küriss, the garniture consisted of double pieces for the tournament and of a new type of armour, the Feldküriss, of which the close burgonet shown here is a part. 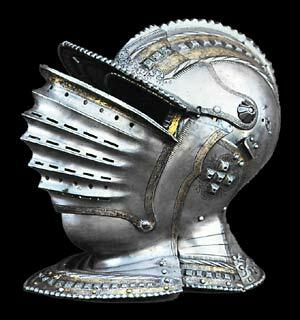 It is derived from the combination of a burgonet with the bevor found on West European armour of the late gothic period. Charles' father, Philip I, had something similar in his armoury. Now his son was using it in its most refined and highly developed form. As usual, a beautiful piece to highlight, Nathan. This is particularly interesting, a Burgonet with a "bellows-faced" buffe! Definitely unusual, but obviously of the very highest quality, as was just about EVERYTHING that Charles V owned! His collection of wheellocks is outrageous (no surprise there! ), and his armour stupendous. Neat too! You got it, Gordon. I was wondering if somebody would mention that. It hit me as pretty damn cool. I'll be featuring that soon, in fact. Pretty damn cool is right! What is also nifty is that Charles' favorite painting of himself is the one showing him mounted, in a light armour, wearing a burgonet. I guess he liked those! But then, he was what you might call an "Armour Horse", just like Grandpa Maximillian.